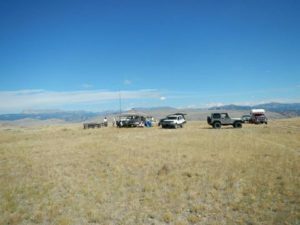 Sparks 31 Down Grid Comm class 7 August 2016 – Wandering Wyoming…and sometimes, other places. Image shamelessly stolen from an attendee. I counted ten adults and two adolescents. The material was similar to the last class I attended in April, but abbreviated. Emphasis was given to signals intelligence, communications intelligence, team building, and team responsibilities. 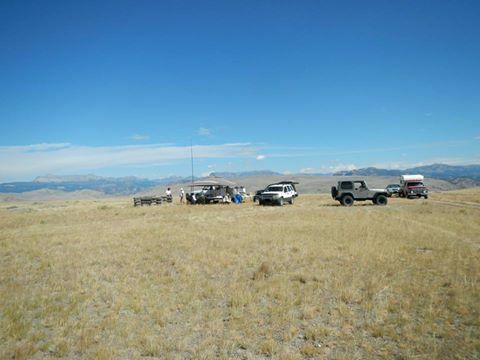 Plenty of time was given to scanner types and their use for gathering information, QRP radio, and hand held communication radios. We broke for lunch, which was provided by two attendees, and was delicious. Shortly after lunch the class moved to a location in Dubois, as there was a storm cell coming that provided plenty of rain shortly after we left the mountain. At the “in town” portion, more equipment was discussed: SWR meters and dummy loads, and a Lander vendor displayed some dual band 144/440 mHz radios and handheld radios. Sparks 31 demonstrated the use of an MFJ-259B antenna analyzer on the CB radio install on an attendee’s Jeep, checking two different antennas. It was an excellent class, and well worth the trip, even though I’ve been to one previously.